Burns, James MacGregor. Edward Kennedy and the Camelot Legacy. New York: Norton, 1976. Collins, Thomas P., and Louis M. Savary, eds. A People of Compassion: The Concerns of Edward M. Kennedy. New York: Simon and Schuster, 1972. Commager, Henry Steele, ed. Our Day and Generation: The Words of Edward M. Kennedy. New York: William Morrow & Co., 1979. English, Bella, et. al. Last Lion: The Fall and Rise of Ted Kennedy. New York: Simon and Schuster, 2009. Kennedy, Edward M. America Back on Track. New York: Viking, 2006. ___. Decisions for a Decade: Policies and Programs for the 1970s. Garden City, NY: Doubleday, 1968. ___. In Critical Condition: The Crisis in America’s Health Care. New York: Simon & Schuster, 1972. ___. True Compass: A Memoir. New York: Twelve, 2009. ___, and Mark O. Hatfield. Freeze! : How You Can Help Prevent Nuclear War. New York: Bantam Books, 1982. Lippman, Theo, Jr. 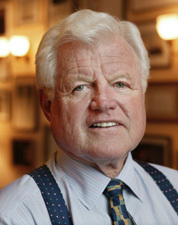 Senator Ted Kennedy. New York: W.W. Norton and Co., 1976. Sanders, Andrew. Senator Edward Kennedy and the Ulster Troubles: Irish and Irish-American Politics, 1965-2009." Historical Journal of Massachusetts (Summer 2011). Sherrill, Robert. The Last Kennedy. New York: Dial Press, 1976. Stanley, Timothy. Kennedy vs. Carter: The 1980 Battle for the Democratic Partys Soul. Lawrence, KS: University Press of Kansas, 2010. U.S. Congress. Memorial Addresses and Other Tributes. 111th Cong., 1st sess., 2010. Washington, D.C.: Government Printing Office, 2010.